The CEK is perfect for non-porous applications such as material handling or critical applications involving glass or sheet metal handling. The CEK single stage vacuum generator is similar to the MC72 with the addition of a vacuum memory valve. As long as there is compressed air, the valve will maintain vacuum “on” during an output power loss, such as an emergency stop. In addition to this valve, an air-economizing valve is included and provides air economizing savings. If the degree of vacuum decays, the integrated sensors will signal to the PLC to turn vacuum back on, the air economizing valve will turn off, and the unit will create a higher level of vacuum in the system. This cycle will repeat and thus conserve compressed air while holding the part. During loss of power, the air economizing valve will turn off and the vacuum memory valve will maintain the degree of vacuum. Other integrated components include valves for vacuum and blow-off functions, a blow-off flow regulating valve, a vacuum filter, as well as an exhaust silencer and vacuum check valve. Optional MPS-23 pressure sensors reduce cycle time and can be used for air economizing to conserve air during part transfer. Inline versions can be mounted in manifolds up to 5 stations. • Unique Option: Air Economizing capabilities with lose of output power. Circuit provisions to continue Air Economizing with part on. CHF high flow series is a multistage vacuum generator. CHF is intended for higher flow vacuum applications that, due to system porosity issues, have a low application degree of vacuum. 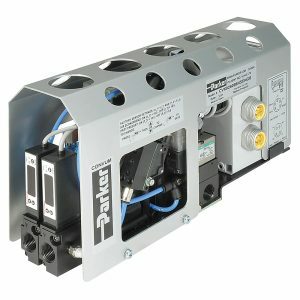 These units are ideal for porous applications. A four bolt mounting pattern with a gauge opposite of the vacuum and pressure inlet ports, enables this generator to be panel mounted. The CHF series comes standard with flow through exhaust mufflers to reduce clogging in dirty environments. An additional pneumatic control valve is required to create vacuum flow. CV is a basic single stage vacuum generator with an aluminum basic body. Vacuum ports sizes range from 1/4″ to 3/4.” CV vacuum generators include exhaust mufflers. Additional pneumatic valves will be required to create vacuum pressure. CV-CK is a single stage vacuum generator with an adjustable open contact mechanical switch for vacuum confirmation. Great for low cost vacuum confirmation. Switch output is normally open and can be connected to AC or DC power. Additional pneumatic valves will be required to create vacuum pressure. The CVX0260B is ideal for non-porous applications that require fast response of large vacuum and blow-off release flow rates, an emergency stop management system, and programmable air-economizing features. The CVX026B is a 2 station MC72 vacuum generator with the addition of an M12 quick connect or DeviceNet electrical package which, combined with the integrated MPS-23 pressure sensors, provides all the programming necessary for air economizing functions. CVX0260B has additional functionality to prevent dropped parts due to loss of output power. During an emergency event or power failure, when the vacuum command signal is lost, the system will detect the presence of a part and continue to operate in the vacuum mode, creating a high degree of vacuum as long as compressed air is provided to the unit. If the system detects that a part is not present, each vacuum channel will remain closed and eliminate unnecessary air consumption when it is not required by the system. Each vacuum generator is operated independent of the other. Therefore, if one generator has a part on, only one generator will create vacuum and use compressed air in an emergency stop event. 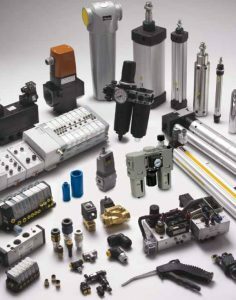 Other integrated components include valves for vacuum and blow-off functions, a blow-off flow regulating valve, a vacuum filter, as well as an exhaust silencer and vacuum check valves. The CVXCEK is perfect for non-porous applications such as material handling or critical applications involving glass or sheet metal handling. The CVXCEK is a 2 station CEK vacuum generator with the addition of an M12 quick connect electrical package which, combined with the integrated MPS-23 pressure sensors, provides all the programming necessary for air economizing functions. The CVX0260B has additional functionality to prevent dropped parts due to loss of output power. This unit provides air economizing functions during loss of output power, increasing the opportunity for conserving compressed air. 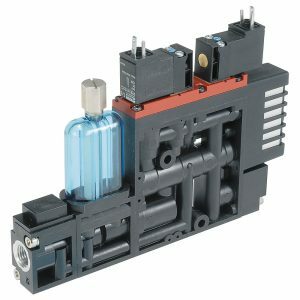 As long as there is compressed air, the vacuum memory valve will maintain vacuum “on” during an output power loss; and the air economizing valve maintains the unit in the air economizing mode. Only with the loss of both input and output power will the unit turn off the air economizing mode and create a high degree of vacuum. In either event, the degree of vacuum will be maintained and the part will be held to the vacuum cup with compressed air. Each vacuum generator is operated independent of the other. If one generator has a part on, only one generator will create vacuum and use compressed air in an emergency stop event. Other integrated components include valves for vacuum and blow-off functions, a blow-off flow regulating valve, a vacuum filter, as well as an exhaust silencer and vacuum check valve. • Unique Options: Air Economizing capabilities with lose of output power. Circuit provisions to continue Air Economizing with part on. The MC22 is a light weight complete vacuum package for factory automation. The MC22 includes vacuum generating and blow-off release valves included with the unit. The small foot print allows the unit to be located close to the suction cup for maximum performance. The MC22 has additional integrated components such as a regulating blow-off needle, vacuum filters, exhaust mufflers, and an optional vacuum check valve. Integrated check valves offer air economizing options with the MPS-23 and MVS-201 pressure sensors. 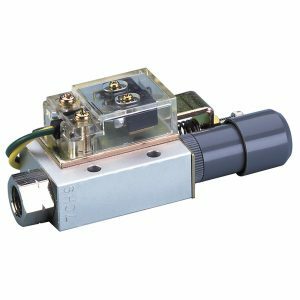 Additionally, the MVS-201 has an output for vacuum confirmation and a controlled output that interfaces directly with the blow-off release pilot valve. This eliminates a PLC output required for low-off release. The sensor automatically activates the blow-off release when the vacuum signal is removed. This is an excellent option for existing applications with only one PLC output and the user wants to add air economizing without changing the PLC Logic. 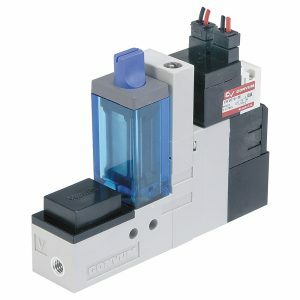 The unit can be ordered normally open or normally closed and be assembled into a maximum 8 station manifold. The MC72 is perfect for non-porous applications such as material handling and critical applications involving glass, or general transfer applications. The MC72 includes vacuum pilot and blow-off release pilot valves to minimize system components and vacuum response times. The MC72 has additional integrated components such as regulating blow-off needle, vacuum filters, exhaust mufflers, and an optional vacuum check valve. Integrated check valves offer air economizing options with the MPS-23 and MVS-201 pressure sensors. Additionally, the MVS-201 has an output for vacuum confirmation and a controlled output that interfaces directly with the blow-off release pilot valve, which eliminates a PLC output required for blow-off release. The sensor automatically activates the blow-off release when the vacuum signal is removed. This is an excellent option for existing applications with only one PLC output and the user wants to add air economizing without changing PLC Logic. 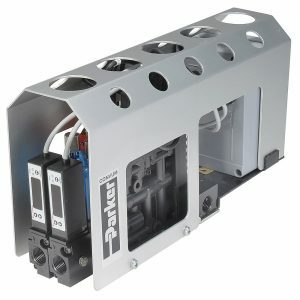 The unit can be ordered normally open or normally closed and be assembled into a maximum 5 station manifold. MCA is lightweight, single stage vacuum generator. Female vacuum ports allow a vacuum cup to be installed directly at the cup, which reduces space and response time of the system. Available port sizes are either 1/8″ or 1/4″ NPT. Additional pneumatic valves will be required to create vacuum pressure. inline ejectors, ejectors including blow-off, plus both small and large integrated ejectors. 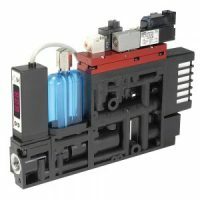 Moduflex Miniature Vacuum Generators offer a compact, lightweight solution for use in a variety of automation and product handling applications, ranging from component pick and place in the electronics and semiconductor industries, to paper, foil and carton handling in the print and packaging sectors. Moduflex Vacuum Generators incorporate a number of innovative features, including a standard blow-off facility, and can be positioned either remotely from the control valve, directly onto a valve island, or mounted inline close to the vacuum cups to minimise space requirements. The Moduflex Vacuum Generator uses proven Venturi technology, where the kinetic energy from a compressed air jet can be harnessed to create a vacuum or suction force, reaching up to 90% vacuum. 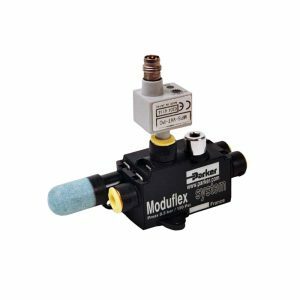 Moduflex Vacuum Generators can be controlled by either a single or double 3/2 electrically or pneumatically actuated valve and can also be supplied with an optional vacuum sensor for connection to machine monitoring systems. Other options include push-in straight, elbow and double main union connectors, plus an exhaust silencer. Additional pneumatic valves will be required to create vacuum pressure. Parker Conflow’s Code 1912 is a Venturi spray nozzle for the purpose of dust suppression on a cutting drum in mining that maximises efficiency, whilst minimising the amount of water it uses. Its design is simple, but highly effective and it produces a ‘hollow cone’ spray form and has a hollow back to draw the air and heavy particles through. Code 1912 produces a powerful jet providing a dense coverage of material. It is available in five different orifice sizes and is suitable for a wide range of pressures from 15bar to 83bar. It has 1/2″ BSP or NPT inlet. It offers a wide range of flexible spray angles from 4 degrees to 15 degrees, providing effective coverage. • Caters for wide range of pressure options. • Produces a dense spray. • Available with 5 orifice sizes, for greater flexibility. • Design provides for maximum air movement within compact fabrication using principle of Venturi. • Easy to bolt into position. • Used as an air mover in chutes and feeder breakers. Parker Conflow’s double flat Venturi provides high directional air movement for cutting machines in mining for larger dust suppression and ventilation requirements. With a 3/8″ port, the Venturi features two adjacent spray heads, offering double the sprayed area and, with its 16” x 8” size, is suitable for larger dust suppression requirements. It operates at a maximum working pressure of 1,500 psi and is available with six different pressures and three nozzle types, depending on requirements. As with all Parker Conflow’s Venturi products, the Code 4129D features interchangeable nozzles across the range to keep customers’ stock levels to a minimum. • Design allows for maximum air movement using principle of Venturi, through a double spray block. • Incorporates brass flat fan sprays, for robustness and corrosion resistance. • Flat fan spray has options on orifice size to suit conditions. • Suitable for use on mines as part of ventilation and dust suppression system. • Belt transfer points, run of mine conveyors and feeder breakers in mining applications. • Suitable for use as part of ventilation system and dust suppression in mines. • Odour control and landfill sites. • Dust control on construction sites. 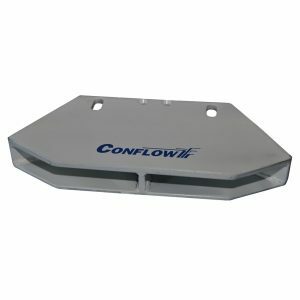 Parker Conflow’s single flat Venturi has a large spray area and is designed to provide directional air movement and dust suppression on cutting machines, conveyor belts and chutes in mines. The Code 4129S is a larger unit than the Code 5102, being 8” x 9” in size with a spray area of 9”, using a single spray head. 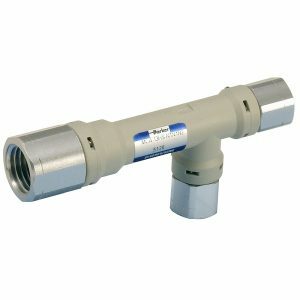 With a 3/8″ NPT port, this product offers a maximum working pressure up to 1,500 psi. 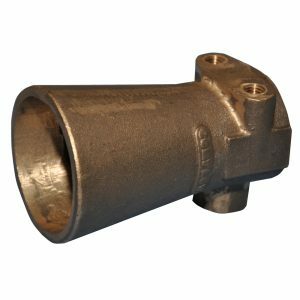 Within this, six different pressures are available with three nozzle types for this product, offering great flexibility to meet requirements. • Incorporates brass flat fan spray, which is robust and corrosion resistant. • Design allows for maximum air movement using principle of Venturi. • Effective dust control system for use on belt transfer points, run of conveyor or feeder breakers. • Odour control on landfill sites. 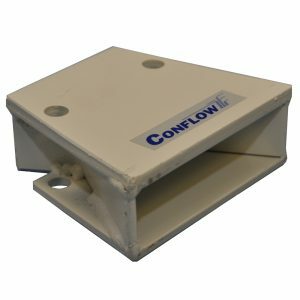 Parker Conflow’s Code 5102 is a single flat Venturi, which provides directional air movement for improved ventilation for cutting machines in mining, conveyor belts or chutes in dust suppression applications. It is designed to allow maximum air movement within a compact fabrication, using the principle of Venturi, the reduction in fluid pressure that results when a fluid flows through a constricted section (or choke) of a pipe. 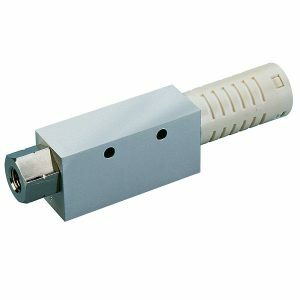 The product is available in three nozzle types and six different pressures. 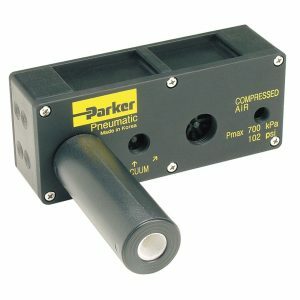 Compact in size, the 6” x 5” unit has a 1/4″ NPT port and operates to a maximum working pressure up to 1,500 PSI/103 bar. • Incorporates brass flat fan spray with options on orifice size to meet project requirements. • Mechanical unit, requiring no additional electrical power. • Robust design, low maintenance. 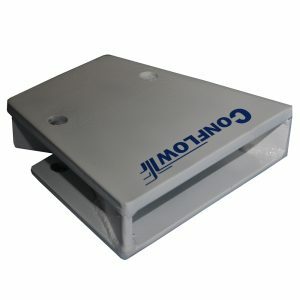 • Easy to bolt onto chute or conveyor.